CHICAGO (FinalCall.com) - In an Aug. 24 visit to his hometown of Chicago, 30-year-old hip-hop mogul Kanye West hosted his Kanye West Foundation’s (KWF) inaugural benefit to raise education awareness and encourage children to stay in school. According to Strong American Schools, an advocacy group trying to make education a priority for the next U.S. president, 1.2 million students drop out of high school every year nationwide, only 46 percent of Black males graduate from high school, and only about half of the nation’s Black and Latino students graduate on time from high school. The day’s events, co-sponsored by Ariel Capital Management, LLC and Strong American Schools (SAS), included a press conference announcement and VIP Reception/Silent Auction at Hotel Sax Chicago, followed by an incredible Benefit Concert at the House of Blues in which the six-time Grammy winner performed tracks from his highly anticipated new album, Graduation. 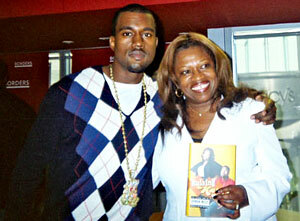 “The purpose of the foundation is to get kids interested in school so that they will want to be there,” said Dr. Donda West, Kanye’s mother, KWF board chair and former chairwoman of the English department at Chicago State University. “Its one thing to say, ‘Stay in school,’ and another to establish a curriculum that actively involves youth in their own education. So certainly we’re developing that curriculum,” she concluded. Established by Kanye West in 2003, Kanye has contributed over $450,000 in support of programs designated to help young people. The foundation’s signature initiative, Los Angeles-based Loop Dreams, is a rap and music production program that involves learning how to produce musical tracks and write and perform raps in a hands-on environment. The program is named after the ‘loop’—a fundamental music production technique in which a sample is played repeatedly. It combines core subjects with aspects of Hip Hop to increase literacy, develop critical and analytical thinking skills, cultivate positive habits of mind and keep students more interested in school. “How does Dr. Dre, a musical genius, layer all these down? How do they do these things constantly? What about the engineering? How do they put this together? What about the poetry aspect, the rhyming stanzas? You can do a hip hop theory. What was this person’s history?” asked Mr. West, as he discussed ideas behind his concept for the program. In Spring 2008, the foundation will launch the Loop Dreams Teacher Training Institute in Chicago, providing training for Chicago teachers interested in incorporating Hip Hop into their curriculum to motivate students, compelling them to stay in school and graduate. “I definitely want to do this in Chicago, where I grew up, where I feel the most loyalty, so it means a lot me,” Mr. West said. KWF also plans to expand their efforts to Atlanta, Washington, D.C., and New York City. Mr. West is currently celebrating the success of the recent launch of his new album Graduation, which hit stores Sept. 11.